I have listed 4 different posts to install LinuxCNC and the kernel's. Each post assumes you have a fresh install of Linux Mint 18.1 installed. I thought it best to start from beginning to end, so you do not have to hunt for specific information. Turned out to be quite long. My apologies. I have tested all of these instructions and have always updated Linux Mint to the latest available. You do not need to worry that updating Linux Mint 18.1 will break the following HOW-To's. I would recommend that you upgrade to the latest software via apt or software manager. Issuing the command below in a terminal window is the easiest way in my opinion. Users are frequently reporting that the following dependencies are sometimes required. If you get this error please follow the steps listed below to fix this issue. Add this repository for these few dependencies only. Once you have added these and built linuxcnc I would highly suggest you remove this source because it is a precise based repo and you would only want this repo for the few sources you need to install linuxcnc. NOTE: POST 1 is a RIP, a rip is for testing/running the software in place [think a portability build] it is not a typical full install of the program. If you want the program to work as on the live CD, then start at post 2. I would recommend that you read through POST 1 for explanations on the steps required. Post 1 = PREEMPT RT all source code building and installing LinuxCNC as a RIP. Post 3 = RTAI Kernel install via apt, LinuxCNC build from source installing as a deb. Post 4 = Just Give Me the CODE!! 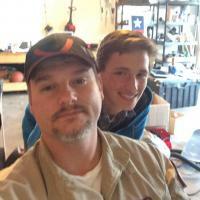 Credits are given to all forum members here; including: PCW, rodw, andypugh, Todd Zuercher, tommylight and multiple others here on the forum; this community is awesome and I always feel that I can get help with any question however “silly” it might be. Linux speak is difficult and it is a huge learning curve. LinuxCNC is not Linux – Period! It is a PROGRAM and since most users do not use Linux and are/were avid Windows user it is a huge undertaking to complete the transition to LinuxCNC. When you install LinuxCNC you have to understand the difference between what is LinuxCNC and what is Linux. Linux comes in a huge amount of “flavors” and each system is different than the next. Most issues arise from not understanding Linux, not LinuxCNC. At least for the install portion – Once installed –configuration—will be the next hurdle. Please understand it is very difficult for someone to speak Newbie when you are no longer a newbie. The key in my mind- is understanding the entire process so you know what question to research prior to asking for help. Google is no help at all if you cannot form the question to ask it. If you only want to copy paste commands and refuse to understand the build/install process required -- then you will have trouble, period. Frustration is going to happen, but we are all here to help you. I’m not a programmer or coder ect.. I am a regular person who enjoys his hobby and have struggled as much as you. My Goal is to ease this transition for Newbies like myself to LinuxCNC; thereby helping build this great community – I’m giving back what I have learned. This is targeted to the audience of newbies that want a better desktop than is provided via the Live CD install. 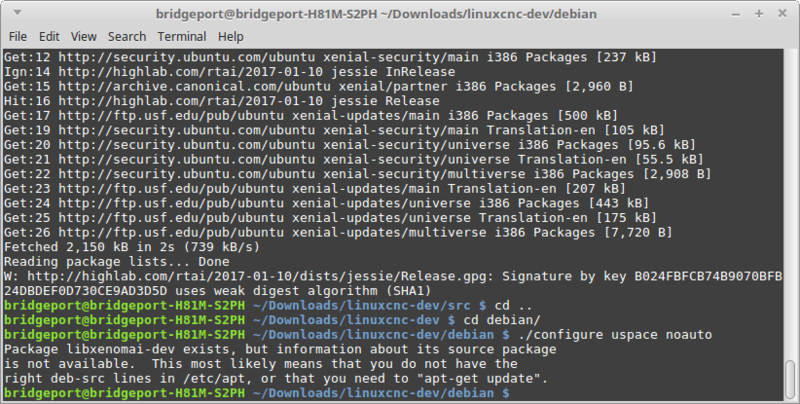 LinuxCNC community is not able to update to another distribution because of copy write concerns “branding ect..”. 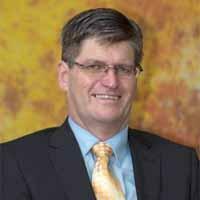 There are other threads in the forum discussing this issue further. Not to discredit the live cd install process, but new guys like me enjoy the new “cutting edge” and shiny stuff So I hope I haven’t given any insult or disrespect to the huge undertaking performed by this community to build a live cd; by streamlining the install process and making installing extremely simple. As a testament --my personal experience using the live CD; I was up about an hour with LinuxCNC. I’m a hobbyist and since I enjoy breaking everything I have; I started tinkering with it now I’m running with mint 18.1 among other distro’s with multiple kernels to test. The Distro I am using and this how to concerns; 18.1 32bit with Mate Desktop. You can search Google for how to make an usb stick bootable with the above image or burn to disc. I personally use the command ‘dd’ to transfer the image to usb. Install as usual > I install the 3rd party stuff [if you install 3rd party you may have to remove ndiswrapper and virtual box later on].. Also don’t overlook the autologin radio button in the same screen as where you input your username and password during install. After the install completes, reboot the computer and once inside of the desktop-- go ahead and install dependencies: you can copy and paste this entire command and paste it into terminal. Dependencies have packages/files that another program depends on – hence the name. When compiling code some files need to be linked to the compiler. Windows users are accustomed to having a program that just installs and basically includes everything to just work, sometimes . Have you ever installed a windows program that said xyz.dll or C++ distro is required? This is the basic idea with Linux. When you issue the configure command, configure looks for files that the program stated it needs, also known as library’s. Sometimes a distro will no longer support older dependencies and that program was upgraded at one point or another. When that happens it becomes a search for the dependency your program requires. It can get quite painful when you can’t find it and have to go on a search. NOTE: Issue this command by copy/paste into terminal. NOTE: Go into package manager and remove ndiswrapper and virtual box. If these are not installed then don't worry about it, at worse case during the build process you get warnings and will not break the build if you elect to not removed these packages. The Kernel is just a brain for the operating system Linux. Distributions (Distro’s)-aka “Flavor” are only a collection of applications put together and released, such as MINT. Some distros change the behavior of where things are installed or some of the functions. That is why open source runs the world. Think android, iOS, Mac and the infrastructure of the internet. Windows has a kernel too, but people do not commonly build windows kernels. Another kernel allows you to use new features and updates while supporting new hardware, hence the 4.8 kernel I chose. In our case we use it for real time purposes. Also at the same time building the “drivers” into the kernel. Doing this means that a driver (think Wi-Fi, network and USB) does not “break” real time handling. NOTE: For this entire process you will be in the root of your home folder. Example - if your name is sam, you will be in the sam folder. NOTE: You can either choose to use your browser to download the kernel and patch or use the command ‘wget’. CAUTION: In the xconfig step you MUST select the proper kernel if 64 bit, Very first option! If 32 bit you can leave this blank, the build will default to 32bit. CAUTION: You MUST at the minimum select "Fully Preemptable Kernel" in the "Processor Types and Features" section. You can use the search function to find this easy. NOTE: After a reboot you can select which kernel using the grub menu you see prior to loading Mint. Launch Grub-Customizer and you can then use it to select your kernel as a default boot option. Do not select the fail safe’s (fallbacks). Reboot your computer selecting the new kernel however you have chosen to do that. Make sure you are in your new RT kernel prior to continuing, should be obvious because packaged kernels state -generic. This is for information on the build process. Read this to understand the process. You need to clone LinuxCNC into your home folder. 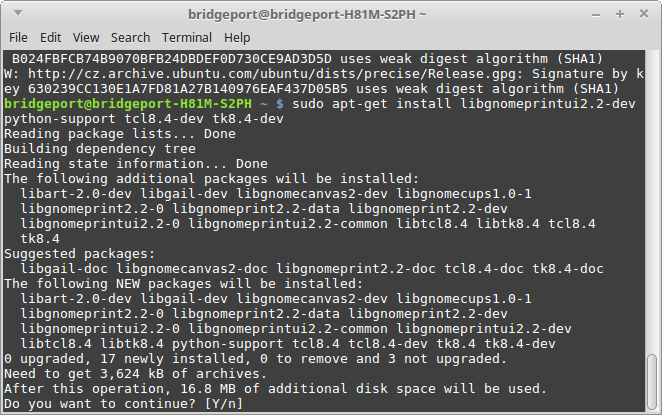 Using the common naming scheme of linuxcnc-dev for the folder name. This will pull all branches including master into the linuxcnc-dev folder. Once executed it will be placed into your home folder. (If you were in your home folder when you issued the command). If you do not issue a git-checkout command during the build process you will build the current master branch. But for now let’s concentrate on just making sure we can build LinuxCNC. NOTE: You need to enable source repositories and apt-get update for the next steps using ./configure uspace. If you do not you will not be able to complete this step. Package Manager>Settings>Repositories> Check Mark - Enable Source Code Repositories. NOTE: If you miss the step of [sudo apt-get update] and on a fresh install it is possible that apt does not know you have enabled the source code repositories and will fail complaining you may need to update apt. Install whatever it is complaining about using the “sudo apt-get install package_name”. Once all build dependencies are satisfied you can complete the build process. For the scope of this how to I'm going to cover RIP builds. For a Run in Place Build (RIP) of Master Branch go into your linuxcnc-dev/src directory. Don't worry! This is because Intel released support for new CPU's without releasing firmware for them. So the warning is harmless. I will edit the main post to answer your questions so to keep the information in one post, as not to scatter it. Also, don't be shy to correct me. I'm a newbie after all Correct information is more important that what I thought was correct. Disregard my spelling, grammar and all around writing style~! Last edit: 20 Dec 2017 20:03 by cncnoob1979. The following user(s) said Thank You: BigJohnT, kostas, PKM, jtc, verticalperformance, jo_key, tommylight, Badger, eFalegname, auto-mation-assist and 7 other people also said thanks. POST 2 = USPACE PREEMPT Building Kernel and LinuxCNC from source and creating a .deb to Install. Install Linux Mint as usual > I install the 3rd party stuff [if you install 3rd party you will have to remove ndiswrapper and virtual box later on].. In this posting I will cover building .deb packages for LinuxCNC and for the Linux kernel. The process is the same except for a few last lines. You'll notice that instead of the make ; make modules_install ; make install, this is replaced with Debian packager. Copy / Paste these commands in sequence. One executed **after the xconfig step** it will auto configure and compile - also sending this to the packager to create a deb file for you to install. Very easy! The benefits are being able to remove and reinstall the package easy. The down side is -- it does take awhile. You will have multiple files created in your home folder. The files will be in your root home folder named linux-headers-4.9.4-rt2_4.9.4-rt2-2_i386.deb ; linux-image-4.9.4-rt2_4.9.4-rt2-2_i386.deb, modules and a multitude of others. You can tell via the size and naming scheme which to install. In my case I wanted to install the kernel headers, modules and also the actual kernel. My kernel package [.deb] was approximately 45MB. To install the deb just click on the individual files and the package installer will open. Click install package and enter your su password. Do this for the headers, modules and the linux-image deb's. I like to use grub-customizer to make my selection of kernel persistent. Once all build dependencies are satisfied you can complete the process. For a .deb install go into your linuxcnc-dev/src directory. Here we have removed the setuid and there is no need to set an RIP environment. Using a deb to install has the benefits of being easily installed and used. It works exactly the same as the packaged one in the live-CD install. Execute this code when you are ready to start building LinuxCNC, after checking build dependencies. NOTE: NOT REQUIRED IF THE ABOVE STEP WAS COMPLETED: Just for information, If you wold like to combine all these steps into a few lines: After cloning linuxcnc-dev and inside of the linuxcnc-dev/src/ directory ; You can check build dependencies / configure linuxcnc / and package into a deb the command's are this: This combines all the above commands to quickly build and configure. You will likely do this on subsequent installs. After completion you will have quite a few debs created here as well. You will have compiled all of the documentation and LinuxCNC. In my case I needed the English doc's [linuxcnc-doc-en_2.8.0~pre1_all.deb] Also, the actual program [linuxcnc-uspace_2.8.0~pre1_i386.deb] around 4MB. You can delete the remainder or just keep them. I keep them in my Download folder. Install them as mentioned previously in the package manager. 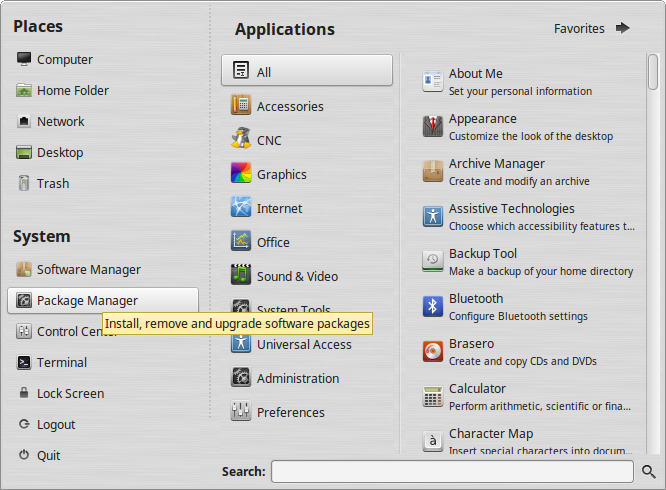 NOTE: After completing the LinuxCNC install you will notice LinuxCNC is not listed in your Main Menu bar. The fix is to click on the menu bar select preferences [you might need to click all applications] > Main Menu > de-select CNC and each sub-menu listed under CNC, then re-select each one again. Thats it! All fixed. Last edit: 20 Dec 2017 20:05 by cncnoob1979. NOTE: I recommend going into package manager and removing ndiswrapper and virtual box. If these are not installed then don't worry about it, at worse case during a kernel build process you may get warnings, but this will not break the build, if you elected not to remove these packages. WARNING: If using a 64Bit OS you must use the 4.1.0 kernel listed below. Or you must build a PREEMPTIVE RT 64bit Kernel listed in Posting 1&2 - I suggest Post 2. The RTAI 3.4.9 Kernel is for 32Bit OS's only. In this section I will cover how to install the RTAI kernel. There are two versions for LinuxCNC tested by me. One being the 3.4.9 and the other 4.1, 4.1 is for testing only, so be warned. The 4.1.0 kernel was created by Sebastian Kuzminsky. 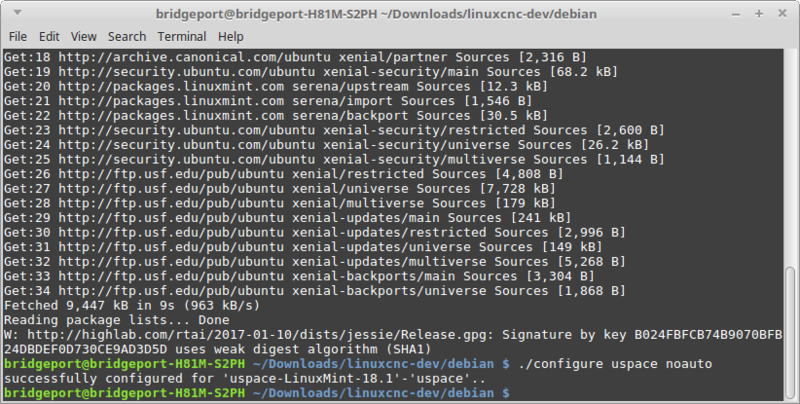 sudo add-apt-repository "deb http://linuxcnc.org/ precise base 2.7-rtai"
Make sure you are in your new RTAI kernel prior to continuing, should be obvious because packaged kernels state -generic. NOTE: You need to enable source repositories and apt-get update for the next steps using ./configure -r. If you do not you will not be able to complete this step. 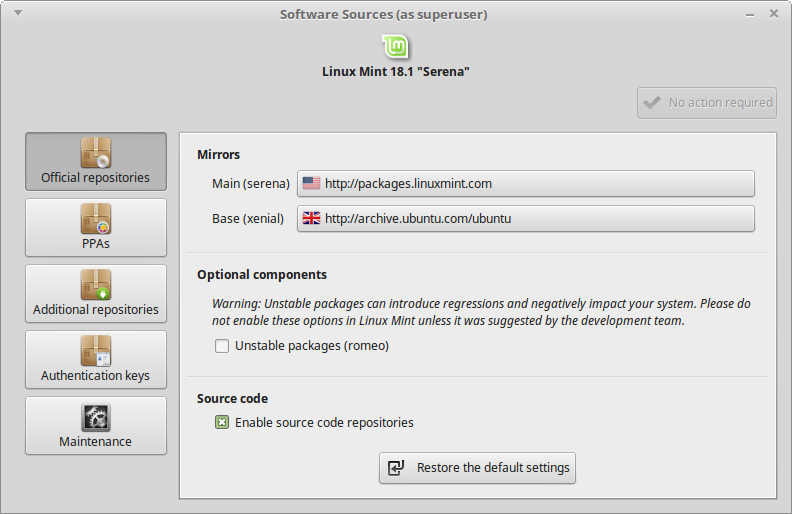 Package Manager>Settings>Repositories> Check Mark - Enable Source Code Repositories. Last edit: 20 Dec 2017 20:04 by cncnoob1979. Last edit: 20 Dec 2017 20:06 by cncnoob1979. When building the kernel, it is very time consuming, particularly after the xconfig step. I rolled this into a bash script but I found that the sudo password timed out and when I got up in the morning, it was paused waiting for a password. So try this. Now I have not tried the last 2 lines, but you should not need to enter your password and after xconfig, you can go to bed and let Linux do the heavy lifting for you! Then run bash ./netstart.sh to restart your network. Shouldn't there be a "service network-manager restart" command? This is a great tutorial, there is a lot of information here. Thanks for sharing. I have not been complete this step: Package Manager>Settings>Repositories> Check Mark - Enable Source Code Repositories. For some reason the check mark option is not active in synaptic manager. Is there any way to get this option active ? Rolquin wrote: I have not been complete this step: Package Manager>Settings>Repositories> Check Mark - Enable Source Code Repositories. 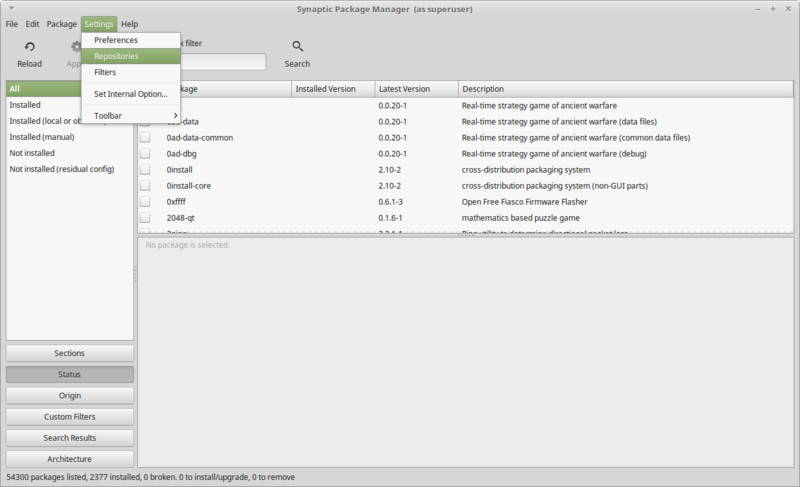 I think you are looking in Synaptic, not Package Manager. Remember that everything in Linux is configured via text files and Package Manager and Synaptic are GUI interfaces to allow you to edit the relevant text files with less pain.. These 2 programs kind of overlap and there are others as well. Is package manager asking you for your su password when you open it? EDIT: sorry I said synaptic; meant synaptic package manager in my response. Last edit: 28 Jan 2017 20:33 by cncnoob1979.